The Orlando, FL Area is Home to Lots of Over 55 Communities. Why Choose Hyde Park? With so many over 55 communities in the Orlando, FL, area, it’s tempting to want to believe that they’re essentially all the same. However, once you get to know a little more about it, you will come to realize that Hyde Park is one of the premier 55+ communities in all of Central Florida. It is one of five Blair Group active adult communities and a place in which you are guaranteed to find lots of resort-style amenities and an affordably priced home exactly to your liking. Hyde Park isn’t just a place to live … it’s a lifestyle. 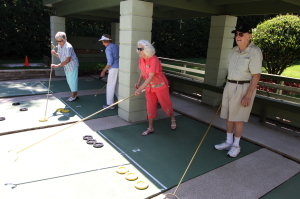 Retirees move here because it is a close-knit gated community that offers virtually all that they need to stay active, have fun, and regularly interact with friendly neighbors of a similar age. Another great thing about Hyde Park is that both Lake Apopka and the Winter Garden Downtown Historic District are easily accessible from our community by golf cart. The historic district is on the U.S. National Register of Historic Places and offers lots of authentic “old Florida” charm and small-town hospitality. For more information, please contact one of our Lifestyle Consultants today. Hyde Park is one of the premier over 55 communities in the Orlando, FL, area.